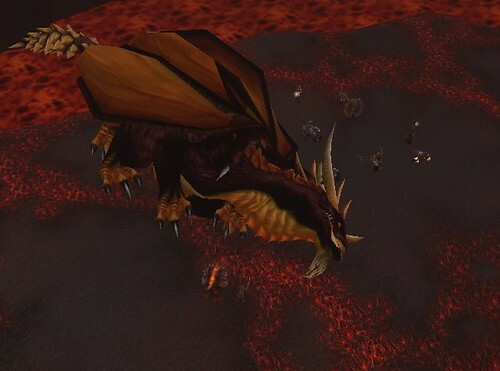 We tossed out the idea of the Legacy toons running Onyxia. The guild has a long association with this raid. The idea seemed to be well-received, but a head count has eluded us. We were going to put it on the schedule for April, but we have no idea who is coming or leveling a toon in order to come along. We need a head count to know how soon we can reasonably expect to do this raid. Please go to this thread and sign up. (You need to be signed in to the web site to see the thread and sign up. While that might be obvious to some of us, others need a reminder.) Our goal is not a list of whether you're geared, it's a simple, "Yes, I want to come." We will handle gearing. If you are still leveling a toon with the intent of participating, we need to know that. Based on this feedback, we will make a decision on when to do the raid. Next item is Black War Bears. Our End of Winter Bash was a huge success. We offed Saurfang with minimal horde resistance. From Orgrimmar, we went to Thunder Bluff and, there was no resistance as we killed Baine. 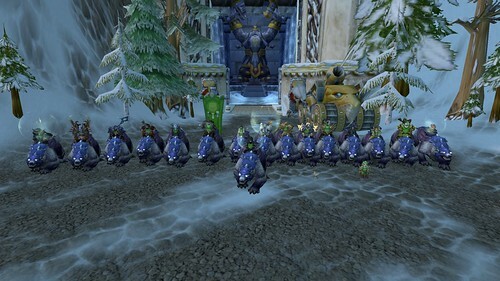 Quite a few people got their bears with Baine's death. A couple people needed Theron, so we headed to Silvermoon and took care of him. We are aware, however, that a few people need one or two of the horde leaders for their bear. We need to know who still needs horde leaders and which leaders. Please sign below with your toon and which leaders you need to complete the achievement For the Alliance. Now is probably a very good time to do this. There aren't many people about and, come Battle for Azeroth, it is likely the capital cities will have more people in them than they do now. We are quite happy to run this as the bit of resistance we have to kill pads our Creepjackers total. We don't care about the level of the toon that comes, although be forwarned. If you are less than 110 and melee, you need to have a spec and/or an attack which can be thrown at Saurfang. His whirlwind is an insta-kill and you will not get credit for him if you have not hit him. We had that problem with one guild member. So, look over your toon list and figure out which one will actually get a hit in on him. Probably level 100+ is sufficient. Thanks for your attention to both of these requests. Cathalii I don't have any Horde leaders downed. So, now what? Well, with 90 minutes still left in raid time, we decided to go into Blackrock Foundry. That raid used up the rest of the time but we downed Blackhand and got the guild achievement. That leaves Hellfire Citadel to clear to have all raiding content up to Legion done horde side. We will be running Hellfire on Monday, April 16th. 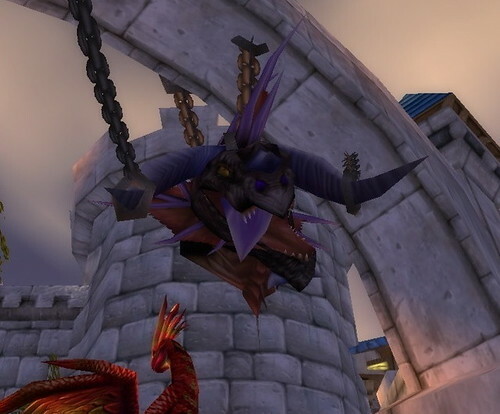 As with Highmaul and BRF, we need a minimum of 8 toons to get the guild credit. Please come if you are able. This is a level 100 raid. If you think you would like to bring a boosted toon, please boost the toon at least 2 days before. 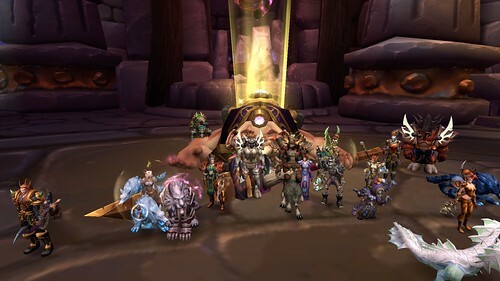 To prevent creating and abandoning toons in order to farm content, a boosted toon cannot come into a raid for at least 2 days after it has been boosted. Please plan ahead. See you on the 16th and let's clear Hellfire horde side. Just a reminder, because it can get lost in all the guild activities, we have a guild for those little used alts you have but don't have the heart to delete. As you know, we are fastidious about the Spectacular Death roster reflecting the active nature of the guild. So, if your alt is one you don't play, it has the potential to be kicked. Quite a few people have their Legacy toons in this guild. It's another way to give you more flexibility in toon management. Just ask, and I can hop over and invite you. After discussion, the officers and I have decided we are not going to restart Antorus every month. While we are not pushing to clear the raid before Battle for Azeroth drops, we don't see value in a monthly restart. Yes, we have the first 4 bosses on farm but we feel we are better served by continuing to push deeper into the raid. We will be doing Antorus twice a month, continuing from where we leave off. We will be alternating weekday and weekend raiding so people who can make one time but not the other can still come along. 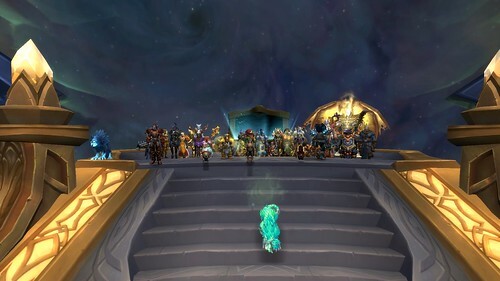 If we clear it on normal before BfA, we will be thrilled, but that's not the ultimate goal. We're just in this for fun and maybe some good tier pieces. If you were along Friday night, when we did Emerald Nightmare, you know we started our tank rotation policy, which is outlined, for guild members, below. Dorvaklynx tanked with Hercules. She did a wonderful job, as Treemoose did last night. We are looking forward to having all people who want to tank, tanking content. When I announced Lynx as the tank, Pinkel quipped, "Awww. Pinkel's not tanking." I burst out laughting. There is a guild story about Pinkel tanking. It's a good one. We were learning Obsidium Sanctum. It's a Wrath of the Lich King-era dungeon. For those who have never been there, a black dragon is in the center of the encounter, on an island. Sartharion is surrounded by lava. There are high cliffs surrounding the lava. On three points of the cliffs, bluish-purple dragons hang out. Each dragon does something different. There are multiple achievements for Sartharion; killing him, and killing him with one, two, or three dragons downed. We were not to the point where we could leave even one dragon up. It was hard with adds, and waves of lava, and knockbacks, and fire. 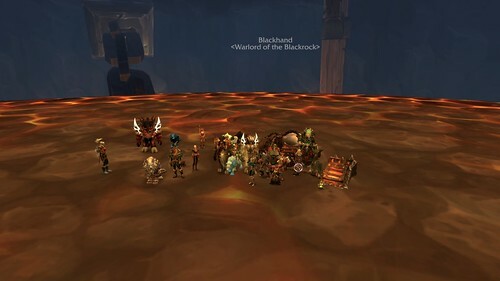 January 9, 2011, we finally did it with all three drakes downed. But, at this time, we were still learning; still trying to escape the lava waves and the fire elementals. 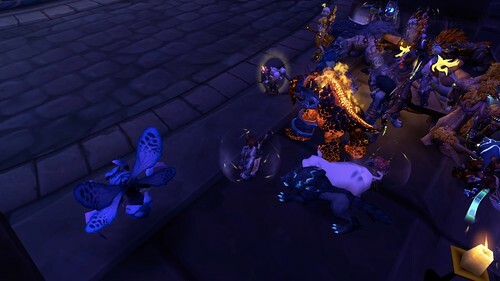 We'd killed the drakes and were standing around discussing the fight and what we needed to do. Someone asked who the main tank would be and I quipped, "Pinkel". 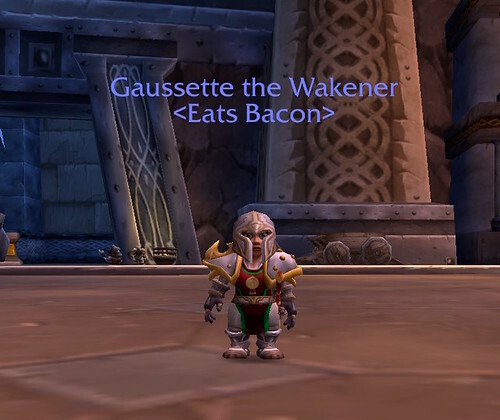 The next thing I know, this pink-haired gnome is racing across the island toward Sarth. My initial reaction was, "What the h*^%? ", not said into, I think we were using Ventrilo at the time. Then I realized what was happening, as did everyone else, and we charged in after her. I do not remember if Sarth ate her as a snack. I do not remember if we managed to down Sarth. I just remember, vividly, the pink pigtails running across the island toward what I knew was certain death. So, when Pinkel quipped that she was going to tank the dragon in EN, all these memories came flooding back. Okay then. If Pinkel wants to tank, Pinkel shall tank. We told her, last night, to tank Skorpyron, the first boss of Nighthold. Hunters kept misdirect up on her every time it was up. She didn't die, which prompted a couple of people to quip, "Nerf discipline priests". Now you know another guild story which has passed into legend. Pinkel, the priest tank. Dorelei Pinkel did an amazing job tanking the other night.